Alaska Gov. Sarah Palin stands with other governors during a press conference at the Republican Governors Association conference Nov. 13 in Miami, Florida. Palin delivered remarks about her feelings on the future of the Republican party. MIAMI — Republican governors gathered here to implore their beleaguered party to reckon with the demographic changes sweeping the country, improve their lagging technological capabilities and win their way back by offering ideas about pressing issues. But that’s not why 220 members of the media descended on the waterside Hotel Intercontinental Thursday. It was for The Sarah Show. While her other governors diagnosed the GOP woes that led to their second consecutive electoral thrashing and plotted a way out of the political wilderness, Sarah Palin did neither. Two events were added to the annual Republican Governors Association meeting especially for the Alaska governor and former vice presidential nominee, but her objectives were unclear and her message, mixed. For somebody who is now seen as a prominent leader in the GOP and perhaps the party’s instant-front-runner for the 2012 presidential race, it was a less than auspicious return to the Lower 48. At a Thursday morning press conference, Palin indicated she wanted to look forward rather than back at her losing campaign with John McCain. “As far as we’re concerned, the past is the past and we’re all focused on the future,” she said, surrounded by many of her fellow Republican chief executives. But then, immediately after addressing reporters, she walked across the hall and delivered a speech before a session titled “Looking Towards the Future” that was largely a nostalgic trip back through the last two months, replete with mention of Joe the Plumber and the other memorable campaign trail moments. 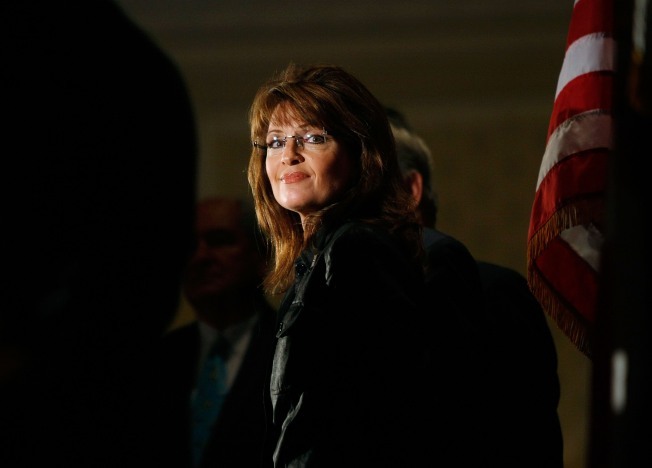 Then, opening her speech, Palin offered: "Let us resolve not to be the negative party." But in the same speech she implicitly offered the same criticism of President-elect Barack Obama that Republicans leveled throughout the fall. “We are not the many voting yea or nay or present,” she said of her fellow governors, a veiled reference to Obama’s “present” votes as an Illinois state senator. And, in language that could have been taken directly out of her or McCain’s stump speech, Palin reminded her audience that Congress is run by House Speaker Nancy Pelosi, Senate Majority Leader Harry Reid and Rep. Barney Frank — to a person, the same three stock liberal villains Republicans invoked in the final weeks of the campaign to warn against full Democratic control of Washington. Asked about what the party could do to appeal to women and Hispanics — two demographic groups which tilted toward the Democrats this election — Palin had little to say about a topic that has been a focus for many of her colleagues. “You know, I treat everybody equally: women, Hispanics,” she said. “Let’s start talking about the conservative solutions to these economic challenges,” she said at one point. Her uncertainty about just what kind of message, if any, to deliver was partially shaped by a desire not to further overshadow her fellow governors. Coming off a round of TV interviews all week, Palin drew hordes of reporters who otherwise would have been unlikely to venture to a post-election governor’s conference of the minority party — including some U.S.-based correspondents for foreign publications. Indeed, it was a meeting unlike any other that veteran Republicans had ever witnessed. A portion of the hotel’s second floor was curtained off to allow CNN’s Wolf Blitzer to interview Palin and broadcast his show with a Biscayne Bay backdrop. And throughout both days, reporters and other onlookers kept a watchful eye in the lobby, hoping to catch the Alaska governor in person. The Thursday press conference featuring Palin drew 23 cameras into a ballroom — more than the total number of reporters who met two other governors and two potential gubernatorial candidates in a small meeting room on Wednesday. And even though she was joined by many of her other GOP governors, the four questions that were allowed during Thursday’s sub-10 minute press conference were all aimed at Palin — leaving her colleagues to awkwardly and silently stand behind her as though they were there present to lend her their endorsement. Aware of the attention she had attracted, Palin repeatedly sought to shift the focus back onto the group. “I want to put to good use my experience that I have as governor of an energy-producing state to help our nation become energy independent,” Palin said, briefly indulging a question about how she could establish her political credentials before catching herself. “You know, we’re going to focus here on what we can do as a team of Republican governors together,” she continued. Palin’s fellow governors, among them many other potential 2012 presidential prospects, basked in the additional media attention she drew to the conference. When asked, they offered measured praise about their Alaska colleague. But they were visibly uncomfortable discussing her, not wanting to criticize a figure beloved by the party base yet also not wanting to pay tribute to a colleague whom some didn’t think was ready for prime time — or who could well be a rival in four years. A Wednesday panel of governors and other conservatives ostensibly designed to examine where the GOP went wrong included virtually no mention of the person who consumed most all of the party’s oxygen from her August 29th selection through the post-election period and who played perhaps the most prominent role of any vice presidential nominee in recent political history. Meeting with reporters later that day, Minnesota Gov. Tim Pawlenty, Utah Gov. Jon Huntsman, and Meg Whitman and Rob Portman, who, respectively, are eyeing 2010 gubernatorial runs in California and Ohio, went from speaking passionately and authoritatively about the GOP’s challenges to an awkward near-silence, turning to each other and initially saying nothing when the dreaded Palin questions came about. After the others had grudgingly taken a turn, Pawlenty, a finalist on McCain’s veep list, spoke up. “You wanted me to respond?” he said with minimal enthusiasm. “Look at the time,” he joked before saying the requisite nice things. But pressed on whether he would have been comfortable with her as president, Pawlenty punted. Silence again permeated when a reporter asked if McCain’s campaign could have better prepared Palin for the public eye. This time, it was Huntsman’s turn to break the uncomfortable pause. “Whatever you say will be the headline, Tim, so go ahead,” he quipped, looking at Pawlenty. Eventually, they lapsed into excuse-making and rationalization. Pawlenty fell back on a frequent Republican talking point during the campaign, noting that Palin’s experience made her no less qualified than Obama. Whitman offered a sports analogy. “John dropped Sarah into the ninth inning of the World Series, three runs down,” said the former eBay CEO and national co-chairwoman to the McCain campaign. In interviews, the governors were guarded when asked about Palin’s political prospects going into 2012. Mississippi Gov. Haley Barbour said Palin helped the ticket but warned against any talk of the next presidential campaign. While the governors were publicly polite, their aides, advisers and other Republicans here at this tropical networking and strategy session looked on at the Palin spectacle with a mix of bemusement, curiosity and annoyance.